Women hold roses as Cardinal Andre Vingt-Trois of Paris celebrates a Mass in Notre Dame Cathedral in Paris on 15 November to pray for those killed in terrorist attacks. When a man dressed head-to-toe in black entered the room where the Rev. Jacques Mourad was being held by the Islamic State, the Syriac Catholic priest thought his time to become a martyr had come. “That moment was really intense and difficult,” he recalled. It was eight days after Father Mourad’s May abduction by Islamic State from Qaryatain, Syria, where he served as prior of the ancient Syriac Catholic Mar Elian monastery. The militants also kidnapped Boutros, a deacon. Together they spent 84 days in captivity. To the two prisoners’ surprise, their would-be executioner did not treat them as though they were “infidels” (Christians), who are considered as impure and beneath fanatic Muslims: The man in black shook their hands, greeted them with “salam alaykoum” (peace be with you) and asked questions as if he would like to get acquainted. When Father Mourad asked, “Why are we here?” the masked man told the priest to consider it as a “khaelwe,” which in Arabic means a time of spiritual reflection, a spiritual retreat. Instead of the dreaded death sentence, the encounter turned out to be a turning point for Father Mourad. From that day, the priest said, his prayers had a whole new meaning, and he began to see his imprisonment as a way to carry and embrace the cross of Jesus. In the 19-by-10-foot bathroom that served as their prison cell, Father Mourad and Boutros spent most of their time praying together. “The prayer that really helped us, that was a source of strength, was the rosary,” the priest said. He added that they also relied on Scripture. As far as the two Christians knew, they were the only prisoners. From behind the locked bathroom door, sometimes they could hear the muffled voices of their captors, or their footsteps. Otherwise, they were completely cut off from the outside world. There was no electricity in their cell. Daylight entered through a tiny window near the ceiling. Nights were dark, long and especially difficult, Father Mourad recalled. The two prisoners were given rice and water twice daily. Tea was added to that ration three times during their captivity. One time Father Mourad was beaten. He distinctly remembers that it was on the 23rd day of imprisonment. Nothing in particular provoked the punishment, which was carried out with a plastic hose, functioning as a whip. Yet Father Mourad said Boutros “was suffering because he was watching me.” Every so often, the priest said, he would turn his head and smile at Boutros to console him. Clever tricks of manipulation were also used, the priest told CNS. The day after the beating, one of the captors apologized for his colleague who carried out the assault on the priest. On 4 August, Islamic State captured and demolished Mar Elian monastery, where Father Mourad had served for 15 years. Aside from the extensive archaeological excavation and renovations he oversaw, the priest promoted dialogue and coexistence between Christians and Muslims. “For many years he built bridges between the religions. This has now proved its value in the war,” Father Jihad Youssef, a fellow Syriac Catholic, told the Catholic charity Aid to the Church in Need after Father Mourad’s abduction. Father Mourad also had been sheltering Christian and Muslim refugees at the monastery. What divides the Greek Catholic and Orthodox churches of Central and Eastern Europe usually reflects the complex history and geopolitical realities of the continent more than any particular theological nuances, even papal primacy. The Slovak Greek Catholic Church is a sui iuris (or self-governing) community in Slovakia — Byzantine in character and Catholic in faith — raised to the rank of a metropolitan church by Pope Benedict XVI in January 2008. It includes some 211,000 Greek Catholics from a number of ethnic groups living in the landlocked country, including Carpatho-Rusyns, Hungarians, Roma, Slovaks and Ukrainians. Led by Metropolitan Archbishop Jan Babjak of Presov, the dynamic Jesuit has bolstered ties between the Slovak church and her daughter church in Canada, where some 2,500 Slovak Greek Catholics form the Eparchy of Sts. Cyril and Methodius. Additionally, the metropolitan archbishop — installed in 2002 — has deepened ties to Greek Catholics in other worldwide jurisdictions. These include the Metropolitan Archeparchy of Pittsburgh and its three dependent eparchies in the United States; the Apostolic Exarchate for Byzantine Catholics in the Czech Republic; and the Eparchy of Mukacevo, now in Subcarpathian Ukraine, or Transcarpathia. In the celebration of the sacraments, Slovak Greek Catholic parish communities use Slovak and its Latin alphabet as well as Church Slavonic and its Cyrillic alphabet. And its territory is restricted to parish communities in the Slovak Republic. Yet the church’s origins and development are synonymous with the various Carpatho-Rusyn Greek Catholic churches of Central Europe. Together, the ancestors of these Catholics received the Christian faith from Sts. Cyril and Methodius in the late ninth century. And they professed their full communion with the bishop of Rome in the chapel of the castle of Uzhorod in April 1646, centuries after the Western (Catholic) and Eastern (Orthodox) churches had drifted apart. According to the Slovak Republic’s 2011 census, only 0.6 percent of the population of nearly 5.5 million identify as Carpatho-Rusyn, proof of the decline of a Carpatho-Rusyn identity among Slovakia’s Greek Catholics. Nevertheless, sustaining solidarity among other jurisdictions of Carpatho-Rusyn origin — Greek Catholic and Orthodox — remains a concern of the Slovak Greek Catholic leadership. Reviving parishes of all ethnic communities; forming a new generation of priests, religious and lay leaders; instilling proper catechesis, especially among the urbanized youth; and restoring parish churches and other parish facilities take precedence for this new yet ancient church. Read a full account of the Slovak Greek Catholic Churches here. Abanoub is a 17-year-old student from El Mahalla el Kubra, an industrial city in the Nile Delta about two hours’ drive from Cairo. When he first came to the home at the age of 5, he admits, he was terrified. “But then I got used to the place and I felt that I wanted to stay there forever. I built a new life for myself and made new friends,” he says. He is currently in his second year of high school and wants to attend college and major in psychology. He recently started learning the guitar. But the transition from a school for the blind to a university can be a challenge. Sister Souad says they begin preparing children for the task from day one. 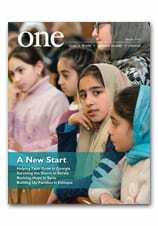 Read more about young people in Egypt journeying “Out of Darkness” in the Spring 2014 edition of ONE. And to help support the Christians of Egypt, please visit this giving page. Smoke rises after the Peshmerga forces belonging to the Kurdish Regional Government (KRG) attack the Sinjar town of Mosul, Iraq, on 12 November 2015. The fortunes of the Orthodox Church in the Czech Republic and Slovakia mirror those of these Central European states, which once formed a united Czechoslovakia. Both the church and state were born after the collapse of the multiethnic empire of Austria-Hungary in 1918. Both were controlled by Nazi occupiers during World War II and then by the Soviets, who commandeered leadership after the war. Both were revived after the Velvet Revolution in 1989 and have since been affected by the dissolution of Czechoslovakia — the so-called Velvet Divorce — in 1993. Though a relatively young community, and numbering only about 100,000 people, the Orthodox Church in the Czech lands of Bohemia and Moravia and the independent republic of Slovakia dates back more than a thousand years. In Europe’s Middle Ages, Latin missionaries worked among the Slavic peoples of the principality of Great Moravia — which covered much of the territory of the contemporary states of the Czech Republic and Slovakia. These missionaries (most of whom were Germanic) introduced the Latin rites of the Roman church in the ninth century and advocated closer ties with Moravia’s Germanic enemies. To counter these efforts, Moravia’s reigning prince, Rastislav, petitioned the emperor in the great Byzantine city of Constantinople to provide Slav-speaking missionaries to work among the prince’s subjects. In 862, the emperor sent two Greek brothers, Cyril and Methodius, who devised an alphabet for the Slavonic vernacular, translated Scripture and the liturgies of the church into Slavonic (it remains unclear whether these liturgies were Byzantine or Latin in rite), and transcribed the first Slavic code of civil law. Despite support from the papacy, the brothers’ work generated hostility among the Latin Germanic bishops. They later drove Cyril and Methodius from Moravia, engineered Rastislav’s removal and, in 886, banished their followers. Greater Moravia collapsed after 893. Its successor state, the Latin Catholic Kingdom of Bohemia, retained its Slavic “Czech” identity despite profound antagonisms and influences from neighboring Germanic principalities — a state of affairs that survived until the decades following World War II. With the breakup of the Hapsburg realm of Austria-Hungary in 1918, and the birth of the Czechoslovak state, a group of Latin Catholic priests called for the use of the vernacular in the celebration of the Mass, optional clerical celibacy and the reception of the Eucharist under both species. Influenced by the work of Sts. Cyril and Methodius, Jan Hus and Martin Luther, these priests eventually formed the Czechoslovak Hussite Church, a national church that grew quickly, especially in the Czech heartland of Bohemia. While this church retained elements of its Catholic heritage, some priests were sympathetic to the 15th-century Hussite scholar and diplomat, Peter Payne, and his interest in Orthodoxy. Heeding appeals from the Serbian Orthodox patriarchate, one priest, Father Matej Pavlik, was received into the Orthodox Church and consecrated a bishop in 1921. Taking the name Gorazd, the new bishop erected two eparchies, one in the Bohemian capital of Prague and another in the Slovak town of Mukacevo, the historical center of Carpatho-Rusyn Greek Catholics. While he was bishop, a large number of these Greek Catholics accepted Orthodoxy after the Holy See imposed restrictions (for example, barring the use of married priests) on their parish communities in North America. A prolific writer and a zealous pastor, Bishop Gorazd established parishes for all of the diverse ethnic communities that made up the Orthodox Church of Czechoslovakia, including Bohemian Czechs, Carpatho-Rusyns, Russian exiles, Serbs and Slovaks. Today, this Orthodox Church is strongest in Slovakia, especially in the Carpatho-Rusyn areas of the northeast near Poland and Ukraine, numbering some 50,000 people. In the Czech lands of Bohemia and Moravia, the church is weak. This reflects the status of religious identity in the modern Czech Republic — a majority of Czechs identify themselves as atheists. Most Orthodox Christians who fill the churches in both republics are guest workers from Greece, Russia and Ukraine and may include up to 500,000 people. Its shepherds, 128 priests, had been placed in Soviet prisons and sent to exile in Siberia, and 20 would never return alive. Some 40 churches had been destroyed by the Communist government, and 273 more were transferred to the Orthodox Church of Russia — the only church the Soviets had authorized, which operated under the strict control of the Kremlin. In 1991, when Ukraine gained independence, the eparchy initially regained only 117 churches and four monasteries from Moscow. Of the more than 500 eparchial institutional buildings that were nationalized, the eparchy was left with 60. As a result, Bishop Milan initially had nowhere to live. The priority was clear: The bishop initiated numerous brick-and-mortar projects — most importantly, a seminary to meet the demand of the newly resurgent faithful. On 22 September 2015, in a moment rich with significance for CNEWA and for Christian unity, Cardinal Timothy Dolan of the Archdiocese of New York — and CNEWA’s chair — formally opened the cause for canonization of the Rev. Paul Wattson, S.A., (1863-1940), CNEWA’s co-founder. Father Paul will now be formally known as “Servant of God,” and further investigation can begin into his life and work. Once his heroic virtues are established, he may be declared “Venerable”; evidence of one miracle attributed to him can result in beatification; a second miracle may lead eventually to the pope declaring him, formally, a saint. For Father Paul, this is the latest milestone in a long journey of faith that has left an enduring imprint on Christianity around the world. It’s a journey that began, in fact, in the Episcopal Church. Long before he helped launch CNEWA, Father Paul was an Episcopal priest, a co-founder of the Franciscan Friars of the Atonement and a champion of Christian unity and helping the poor. The Society of the Atonement, consisting of the Franciscan Friars and Sisters of the Atonement, was founded in the Episcopal Church in 1898. In 1909 the entire community sought and received communion with the Roman Catholic Church. Significantly, Father Paul and his community did not leave the Episcopal Church motivated by anger or rejection; rather he saw his “journey to Rome” as the logical continuation of his commitment to the unity of all Christians. This passion for unity manifested itself his preaching and writings. But even more importantly, this commitment led him to found the annual Chair of Unity Octave, eight days of prayer for Christian Unity from 18-25 January. This observance, which started at Graymoor, Garrison, New York, was recommended to the universal Catholic Church by Pope Benedict XV. The Church Unity Octave over the decades evolved into the Week of Prayer of Christian Unity, which is now observed by Christians throughout the world. In a world in which the ecumenical movement was just beginning and did not enjoy wide acceptance, the attitude of Father Paul toward non-Latin rite and non-Catholic churches was unique. In the early 20th century, the Catholic Church in the United States had recently experienced the loss of a quarter million Eastern Catholics because of the insensitivity of Latin Catholics to the legitimate practices of the Eastern Catholic churches. The attitude towards those Eastern Catholics who remained was often one of ignorance and distrust. Relations between Catholics and Protestants were hardly better. CNEWA is proud that one of its founders is now continuing his journey — this time on the road to sainthood. You can read more about Father Paul in the Autumn 2015 edition of ONE.